Day 2: No Coat. If you have no idea why I am going 10 days without a coat click here and here. Children, adults, the homeless in my own hometown are walking around without this luxury and I want to raise awareness it's in our own town not some far off land. Today we were given tons of snow. It really just keep snowing all day long. I went out and walked the dog, shoved the front walkway. Then I decided to shovel the backyard walkway. This was when my body started to feel the effects of no coat. The rest of my body felt the wrath. Without a coat you just have a hard time functioning outside because all you think about is getting warm. I am so thankful I can purchase a coat when I need one. I can't imagine not having that and wow have I taken it for granted! 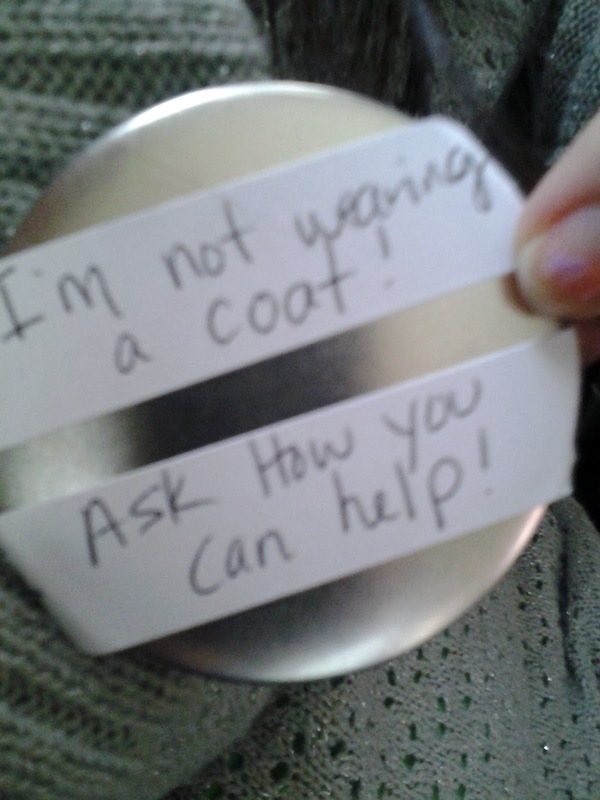 I decided since I was going to be out and about I had to start a "coat convo"
I started wearing this button! Just to draw attention to the obvious and strike up a conversation. It worked like a charm. I talked about my drive at Physical Therapy, Wegmans, Dollar Tree you name it! This is such an easy donation drive to do really and I appreciate all the coats donated so far. Coats collected= 3 full Bags, Plus the 11 already donated! !